Objective: Nurse workload in intensive care units (ICU) is an important factor that might affect patient outcomes. The Therapeutic Intervention Scoring System-28 (TISS-28) is an instrument to measure nurse workload. The objective of this study was to compare the nurse workload between two different ICUs and evaluate its impact on ICU mortality. Material and Methods: The study was designed as a prospective observational study. 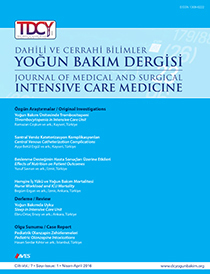 Medical and neurological ICUs (MICU and NICU, respectively) of a tertiary reference hospital were compared between April 15 and August 30, 2011, and data from 166 patients were prospectively collected up to 1 week. Nurse workload was evaluated using median TISS-28 scores. Results: One hundred twenty patients were included from MICU and 46 from NICU, with a median age of 72.7 years. The median TISS-28 score for the first day in MICU was 28 (interquartile range IQR, 22-36) points, whereas it was 25 (22-27) points in NICU (p=0.024). Overall ICU mortality was 46.4%, and it was 40.8% for MICU and 60.9% for NICU (p=0.020). Non-survivors had a higher TISS-28 score than that of survivors (29 24-35 and 26 23-28, respectively; p=0,004). In the logistic regression model, only the APACHE II score and admission to NICU were found to be independent factors for mortality. Conclusion: This study showed that there is a marked difference in the nurse workload among different ICUs. Although patients who were lost had higher median TISS-28 scores, TISS-28 was not independently associated with mortality, and in this study, we did not observe any direct effect of workload on mortality. However, the monitoring of nurse workload, source allocation, and quality of care is indispensible, especially if there is a concern regarding limited resources.